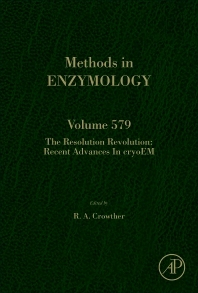 cryoEM, a new volume in the Methods in Enzymology series, continues the legacy of this premier serial with quality chapters authored by leaders in the field. This volume covers research methods and new developments in recording images, the creation, evaluation and validation of 3D maps from the images, model building into maps and refinement of the resulting atomic structures, and applications of essentially single particle methods to helical structures and to sub-tomogram averaging. Tony Crowther is an emeritus scientist at the MRC Laboratory of Molecular Biology in Cambridge, where he was joint head of the Structural Studies Division from 1994 to 2005. He has been involved in electron microscopy and image processing of biological structures for many years. His particular biological interests have been in viruses such as hepatitis B and in the abnormal filaments that form in neurodegenerative diseases. He is a Fellow of the Royal Society of London, a Fellow of the Academy of Medical Sciences and a member of the European Molecular Biology Organization.